For the past four years, residents of California have been battling one of the most severe droughts in the state’s history. As a result, California is currently witnessing one of the worst fire seasons ever. From July into August, firefighters found themselves battling a fire system named the “Rocky Fire” which burned almost 70 thousand acres of land. 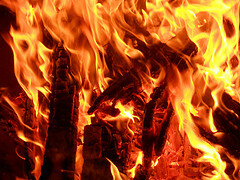 In general, fires are named after the area where they are believed to have started. One of the worst wildfires in California history, the Cedar Fire is also known by two names that express its devastating size: Fire Siege of 2003 and 2003 Firestorm.